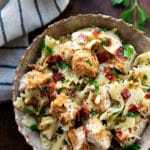 Simple and cheesy baked chicken alfredo served over a creamy pesto pasta topped with bacon and pine nuts! I know pesto is kind of a summer thing, but don’t leave yet. Because you are totally going to want to try this and the pesto is NOT required. 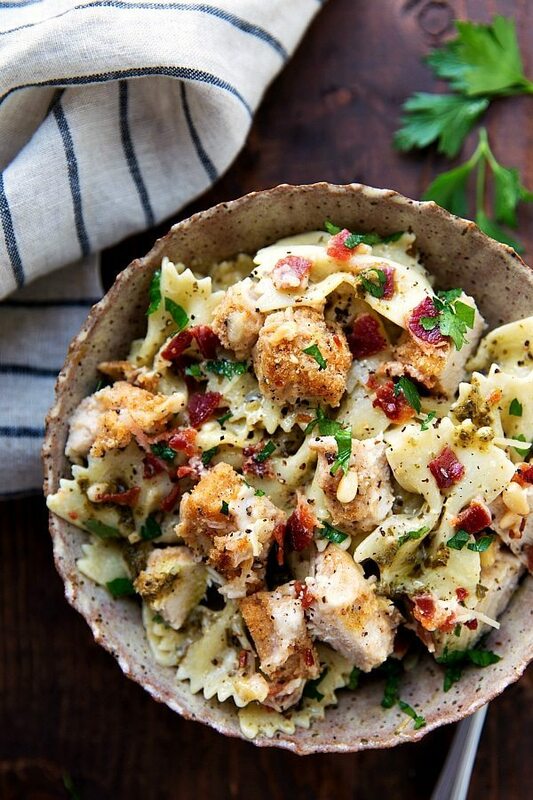 In fact the real star of this dinner is that cheesy breaded alfredo chicken and the pesto pasta is just an idea of what to serve the chicken over. 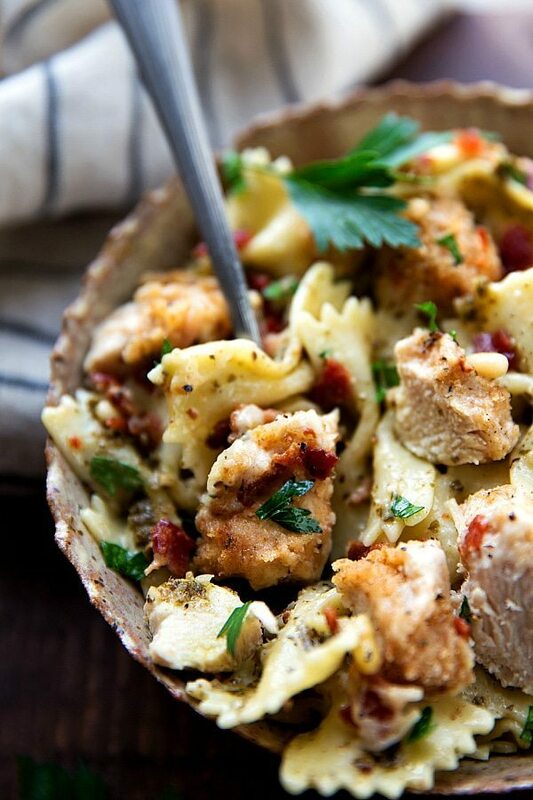 You could also serve the chicken over buttered noodles, alfredo coated noodles, rice, quinoa, etc. There are tons of options which is what gets me so excited about this recipe!! This recipe has a few steps to it, but it is quite simple and comes together nicely. Give yourself a good thirty minutes of prep time and dinner will be ready! Preheat the oven to 400 degrees F. Spray an 8 x 8 baking pan with nonstick spray and set aside. Remove fat from the chicken and cut the pound of chicken breasts into 8 even pieces. Set out 2 bowls, in one place 1/3 cup alredo sauce in the other place the breadcrumbs, Parmesan cheese, Italian seasoning, garlic powder, and salt + pepper. Dredge each chicken piece in the alfredo and then in the breading. Place in the prepared 8 x 8 pan. Remove and cover with 2/3rds cup alfredo sauce and 1/2 cup mozzarella cheese. Return to the oven and bake for another 8-10 minutes or until the chicken is completely cooked through. Meanwhile, prepare the pasta according to package directions. 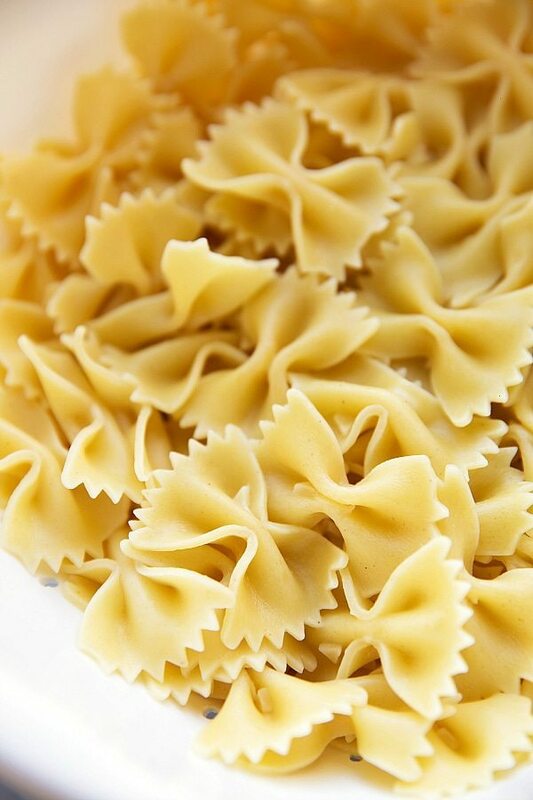 Drain and return the pasta to the pot and the stovetop over medium heat. Add the remaining alfredo sauce to the pasta and then add the pesto. (Add to taste, I used 1/4 cup, but you may want a bit more depending on preference.) Add salt + pepper to taste. 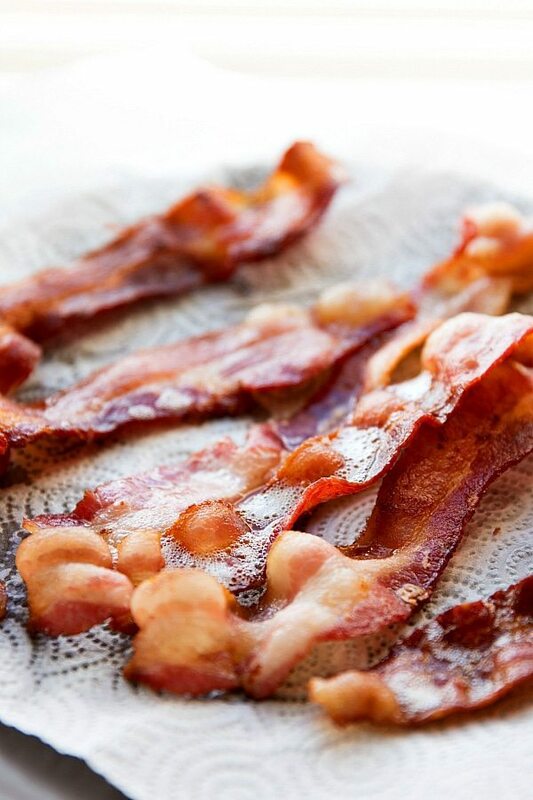 Meanwhile, cook the bacon until crispy. Remove to a plate lined with paper towel. Dab off the excess grease and crumble. 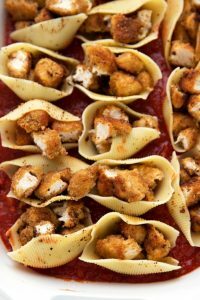 Remove the chicken and slice into bite-sized pieces. 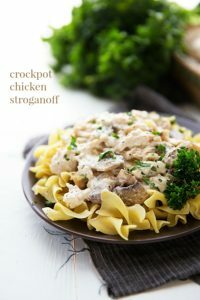 Easy slow cooker chicken stroganoff — NO cream of soups! Oh, yum! This sounds delicious (and hard to beat)! Good luck! Chelsea, this dish looks amazing. Good luck with the contest!